Forthglade Grain Free Love Dog Treats are 100% natural and wholesome hand-baked treats that are so delicious that your dog will truly know how much you love them. 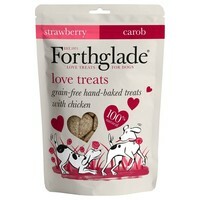 Containing tail-waggingly tasty strawberry and carob (a dog-friendly alternative to chocolate), Forthglade Love Treats are bursting with goodness and can be easily broken into two for smaller dogs, or just to make them last longer. Yucca Extract: Helps improve digestion and reduces the chance of any unwanted smells!